Master of the macabre Vincent Price strikes terror in the hearts of moviegoers once again in Roger Corman’s Gothic thriller, The Pit and the Pendulum. Smartly adapted from Edgar Allen Poe’s classic tale by screenwriter Richard Matheson, Corman was still a young director cutting his teeth in 1961 when the movie was first released. 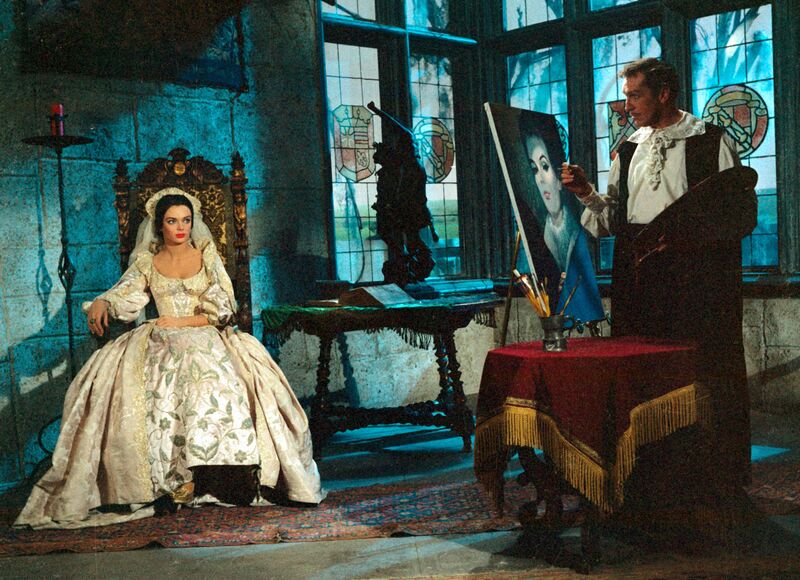 The second film in a series of Poe-based movies made for American International Pictures after the successful House of Usher, it features a memorable turn by Barbara Steele and one of the most unforgettable final shots in the history of horror movies. The Pit and the Pendulum is set in 16th Century Spain with the horrors of the Inquisition still fresh in everyone’s mind. Francis Barnard (John Kerr) from England visits the castle of Spanish nobleman Nicholas Medina (Vincent Price). Barnard is investigating the mysterious and sudden death of his sister Elizabeth Medina (Barbara Steele), Nicholas’ wife. A distraught Nicholas offers vague explanations about his wife’s passing to Barnard. His castle is a foreboding place, soon revealed to have torture chambers and other unexplained features dating back to the time of the Inquisition. Nicholas seems to be losing his mind as a result of his wife’s death, suffering fainting spells and beginning to question his own sanity. His sister Catherine Medina (Luana Anders) attempts to calm him and assuage Barnard’s concerns. A close friend of Nicholas is Dr. Leon (Antony Carbone), a shady physician that was the one to pronounce Elizabeth’s death and seemingly eager to get Barnard out of the castle. Nicholas believes he is being haunted by Elizabeth’s spirit when her harpsichord playing is heard by everyone. Spooked, they decide to break open Elizabeth’s interred crypt behind a brick wall. It all builds from there to a terrifying climax involving a swinging pendulum of death. Science fiction legend Richard Matheson of I Am Legend fame and countless other novels brilliantly turned Poe’s original story into a tense, gripping narrative. The role of Nicholas Medina is an interesting one for Vincent Price, as the character loses his grip on reality as the plot builds steam and we learn the horrible backstory behind his mother’s death. This is not the commanding presence seen in so many other roles by Price. If The Pit and the Pendulum has one weakness, it is the wooden acting by John Kerr as Francis Barnard. Do not expect to see a lot of Barbara Steele. Her character plays a critical role in the narrative but it is a small role. Gothic horror hit its heyday in the 1960s and this movie plays a part in that status. From the frightening production and terrific art design, to a psychotic performance given by Vincent Price, director Roger Corman’s The Pit and the Pendulum has stood the test of time as an enduring masterpiece of terror. Arrow Video delivers a very satisfying 1080p presentation of this Gothic masterpiece. Using MGM’s high-definition film transfer from the original elements, the video has nice definition and palpable film texture. It is a newer transfer with loads of fine detail and an un-manipulated color timing appropriate for the movie. Largely identical to the transfer used by Scream Factory for their American version released last year, the source elements have negligible damage. Detail and resolution are fairly typical of a film scan done at 2K resolution, though it is completely unfiltered and nicely preserves the grain structure of the 35mm film stock. The main feature is properly framed at its intended scope aspect ratio of 2.35:1. Arrow Video always maxes out their AVC video encodes and this one is no exception. The 80-minute main feature averages an exceptional 34.86 Mbps, taking up most of the space on a BD-50. That type of figure allows it to cleanly replicate the nuanced shadow detail and grain inherent to The Pit and the Pendulum, a somewhat low-budget horror movie of its day. The better compression results on this UK BD are the primary difference between Scream Factory’s BD and this presentation. The cinematography is a little soft in spots, especially in the colored flashbacks. The interiors of the castle are sharp and give off rather nice detail in close-ups. Crisp black levels and perfect flesh-tones are rendered in a pleasing contrast. This is not the flawless, pristine cinematography of bigger Hollywood films from the period, but the film has never looked better since release with a stable color palette. Some very minor ringing to the transfer is present at times, most notable in the opening act. The original monaural soundtrack is included in 1.0 PCM. Les Baxter’s score strikes the appropriate mood but the overall sound quality is thin and harsh. The less than pristine audio recording shows its limitations with a hissy background and dated fidelity. Corman’s movies always looked better than they sounded, including the occasional dubbing problems. This is an underwhelming sonic experience, limited by production problems. It does a serviceable job with the dialogue but that is all. Also included is an isolated music & effects soundtrack in uncompressed mono sound, a nice bonus unique to this edition. Optional English SDH subtitles display in a white font outside of the 2.35:1 widescreen framing of the film. Like many of Arrow Video’s newer releases, there are two different editions for The Pit and the Pendulum. The content is identical but a limited edition steelbook is available, separate from the cheaper regular edition in a normal Amaray case. Featuring a bevy of exclusive features found nowhere else for this film, the new 2013 documentary is a very entertaining, in-depth look at the film with key insights provided by Roger Corman and Vincent Price’s daughter. True fans need to watch these special features, it’s a far superior edition to the BD issued in Scream Factory’s Vincent Price collection. The two commentaries are fun and entertaining in their own ways. Corman gives quite lucid commentary on his film and is an engaging speaker. Tim Lucas’ commentary is exclusive to this disc, his knowledge as fan and critic of this period’s films throw additional insight into the background behind The Pit and the Pendulum. The Story Behind the Swinging Blade (43:07 in HD) – A new documentary on the making of The Pit and the Pendulum featuring Roger Corman, star Barbara Steele, Vincent Price’s daughter Victoria Price and more. Added TV Sequence (05:04 in HD) – Shot in 1968 to pad out the film for the longer TV time slot, this scene features star Luana Anders. An Evening of Edgar Allan Poe with Vincent Price (53:07 in upscaled HD) – Price reads a selection of Poe’s classic stories before a live audience, including The Tell-Tale Heart, The Sphinx, The Cask of Amontillado and The Pit and the Pendulum (with optional English SDH). Note: Due to technical issues, there are no screen shots available for this disc.